How to get to R4DR? 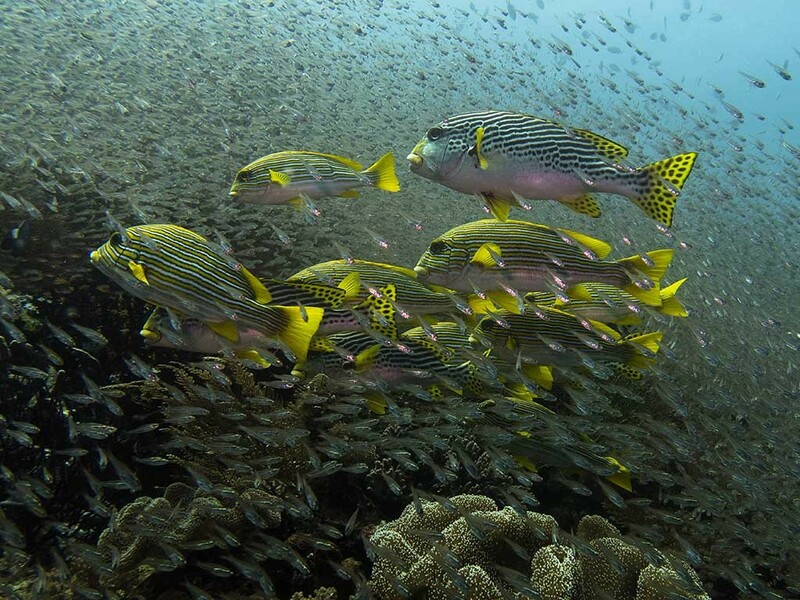 Raja Ampat is one of the few places on Earth where you can still find most of the existing marine life species. Its biodiversity makes the area popular, well known as a unique marine life epicenter. White tip sharks, black tip sharks, grey sharks, green turtles, oceanic mantas, black and white-bellied mantas, schools of mobulas, schools of bump-head parrot fish, huge schools of barracudas, Jacks and many others can be seen in Raja Ampat reefs. Pigmy sea horses, different species of nudibranch, ghost pipe fish, mandarine fish, blue-ring octopus and harlequin shrimps delight all macro-lovers. Endemic species such as Wobbegong shark, Raja Ampat carpet shark (known as “walking shark”), mantis shrimp and many others will surprise divers with its exoticism and beauty.